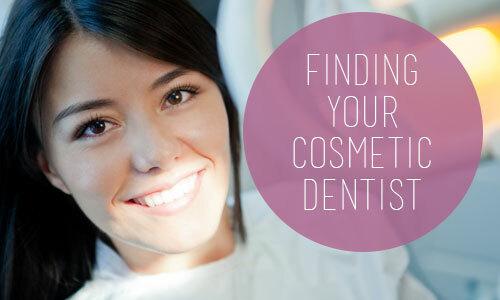 8 Things to Look For When Selecting a Cosmetic Dentist? to have a dentist who teaches other dentists, either by lecture or published articles, how to complete good cosmetic dentistry. Expect a good cosmetic dentist to make a lot of photographs before, during, and after the treatment. You should also expect to see a virtual smile makeover photograph before starting to give you an idea of the final results. Cosmetic dentists will usually provide a wax model for your approval prior to starting your case. A wax model gives you a 3-D view of your new smile. Expect your cosmetic dentist to be wearing magnification loops or glasses. Not because he has poor eyesite, but to magnify your teeth to 2.5 to 5 times their normal size. If everything looks good under that kind of magnification, it will certainly look good to the naked eye. While your custom crowns or veneers are being constructed in the lab, you should expect your temporary crowns to look beautiful and almost like the final product. It takes a long time to properly prepare and place cosmetic crowns and veneers. Look for a dentist with enough patience to take the time to do the job right the first time. Last but not least, a good cosmetic dentist will work closely with a high- quality cosmetic dental lab in order to provide you with the best and most pleasing natural results.